My daughter turns 15 this weekend. I look back at the person I was before I became a parent and even I am amazed at the growth. Growing up as a young girl I knew I always wanted children of my own someday. I mean that’s what happens when you grow up right? You get married and have some babies. That is about as far as a young girls mind really goes. You have absolutely no comprehension of the amount of work and time it takes to raise another human being. From the minute that child is born we become mom. We do not get breaks or vacations, or even a pass when the job becomes more than our beating heart can bear. There is no way to do it part time. It is a full time job with overtime and every weekend included. So, what is the biggest lesson I have learned from being mom. It is pretty simple. In a world filled with people who look the other way, in a world consumed by sitting on a bleacher to cheer for your kids six different sports, in a world where people hide behind their over scheduled lives, I choose a different path. I have learned that my job of being a parent does not end when all the activities are checked off the list. My job and my day ends when I can do every possible thing I can to make this world a better place. I will not look the other way. I will take on the fight to make things better for all kids everywhere. Whether it is becoming an active voice in my children’s sports and schools, or simply being a voice for the child who is too weak to speak up for himself, that too is part of being mom. Imagine if all the parents in the world would see that their job description extends to all the children in the world and not only acting in the best interest of their own. See how serving one does not serve all, but serving all will serve everyONE? We wonder why things seem so unbalanced and why our way of life is becoming so unraveled. I don’t have all the answers, that I know, but I can’t help but think a different mindset would make the world a better place for everyone in it. What do you think? It is amazing how much you can grow as a person when you take on the role of raising a child. Imagine how you’d grow if you felt every child in the world was yours? As I sat in a school meeting today gently guiding the administrators to a plan that would lead to our kids success in school, I was reminded of a small wooden token I use to give as a gift. I have a very logical and honest approach to sense of humor, so if I can use my sense of humor to leave someone with a lasting reminder of my incredibly gifted amount of knowledge, I stick my neck out and give it a go. Minutes and minutes went by with words filled with hope for a plan of action. Lots of planning, lots of talking and lots of time slipping slowly away. Of course my mind was thinking the school year is more than halfway over so we need to hurry this process up, so I thought of sending every teacher and administrator involved a little token of my appreciation and a forceful reminder that we are quickly running out of time. My gift idea? A round tuit. I really think I may be ordering them in bulk as soon as today. 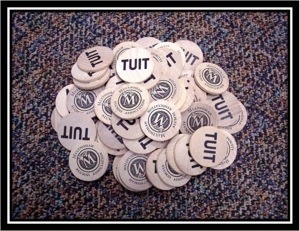 So, here it is, for those of you who have not yet heard of the history of the round tuit. Isn’t it amazing that so many years ago there was an awareness of a problem that has only grown worse today. So I invite you to sit back and pay attention. At least years ago they were smart enough to try and come up with a solution, but today it has become our way of life. And we wonder why we are in a vicious cycle of not getting anywhere quickly. PLEASE TAKE ONE, THERE ARE PLENTY TO GO AROUND! Today was the day I’ve been dreading all week. I am very sensitive when it comes to my teeth. I don’t like people pulling them, or scraping them or quite honestly even looking at them, but it had been six months and I was there in the chair. I tried to close my eyes and pretend I was on “some beach, somewhere”. I even sang that song over and over again in my head. But when I opened my eyes I could see the high school in the distance outside the window. That in turn reminded me of my teenager daughter who I adore but become easily agitated around which explains why, when I glanced up at the metal instrument with the small hook, I envisioned sticking it into her sassy little tongue. I grew a fondness for that little tool and passed several minutes fantasizing over so many ways I could put it to use. I could stick it in her tongue so she could no longer speak. And eye rolling? Imagine how quickly we could put an end to that little ailment. I could dangle that angry little eye on the end of the tool while laughing my evil laugh and taunting “can you roll at me now?”. I know you are sitting there thinking “she really shouldn’t have said that aloud” and just for the record I didn’t, I just foolishly wrote it down. So, I was patiently waited for my cleaning to be over and soon it was. The dentist came in to take a look and although he shows up the same way every time, I am always amazed he doesn’t wear a mask. So there he was, leaning over me sticking his tools in my mouth while I am shutting my eyes tightly praying his nose does not decide to drip into it. Then he moves slightly and through my tightly closed eyes I see the light, but thankfully I do not follow it so I spare my forehead what could easily be a very red, large, rectangular mark to remind the world of my silly daydreaming. I then hear the words “See you in six months Kimberly” and jump out of the chair grateful I survived. No teenagers were attacked during or after the writing of this blog. And just for the record, I am not a violent person I just have a violently active mind. And, believe it or not, when I forced, I mean encouraged my daughter to read it, she couldn’t stop the smile that came creeping across her face. Hopefully this didn’t offend anyone, I know my sense of humor is a bit rare! Will You Join my Mission? There is nothing more guilt provoking than a teacher staring into your face and telling you that you make too many excuses for your child. Imagine sitting in a chair, believing with every fiber of your being that your child is just not learning. Sitting up and wondering each night where everything could have gone so wrong. Confiding in a teacher that you cannot help your child at home anymore, because the hours and hours of trying to teach your child what he couldn’t grasp in school, was tearing your family apart. Imagine thinking a teacher is going to console you and tell you your instincts are right, that she too has noticed something isn’t quite right. It plays out perfectly in your head, which is why you finally have the courage to go in and admit that the problem is bigger that what you, MOM, the person that could always fix everything, cannot fix. Then, imagine that same teacher that you spilled your heart and soul to telling you that you are part of the problem. She has all the answers. “Mrs. H you don’t let your son take responsibility for his actions. He often doesn’t pay attention and is easily distracted. I don’t think he really cares about his school work and you need to stop trying to make excuses for him.” That is the is the moment your eyes start to fill with tears and you throw in the towel. You believe what you are hearing and you second guess yourself and accept that this problem only you believe exists, must have been fabricated in your own head. Imagine hearing this for 3 separate years, and losing belief in your gut feeling that is screaming at you that something really is wrong. That is the point you back off and start to point your finger at your child. The things I would say to him still break my heart. I wish I could go back and save him from all the struggle he has faced the last few years. How awful it must have been to try and do work when you didn’t even understand what the directions were asking to do. Then, getting through the work that is already late with a 10 point deduction, and getting a grade so low, that you would have to redo the entire thing and without any further instruction. Imagine that poor child. Do it over, do it better, read the directions more carefully. That is what he was told. It is terrible believing you are one of those parents. Believing you have this perfect child and his failures cannot be attributed to laziness and wanting to believe something must be wrong. You make yourself crazy researching and reading up on every sign and symptom of learning disabilities. You finally work up enough courage to suggest maybe he should be tested for special ed. The response, “what kind of parent wants to flag their child their entire life?” Your mind races and responds to the question quietly in your own head, not a very good one. You turn your head the other way and hope the struggle will subside. Before you know it, you wake up and your child is in 5th grade. I remember getting a call from my child’s 2nd grade teacher. It was only the second week of school and I couldn’t imagine what he could have done wrong in such a short amount of time. I will never forget the sound of her voice and the words she spoke, “I am really sorry to have to tell you this, but I am very concerned your son will not pass 2nd grade. He is way behind his classmates in reading but I will do everything I can to bring him up to speed.” She was an angel in disguise and did so much more than “bring him up to speed”. He stayed in every recess to practice reading and the excitement the teacher shared spilled over into his desire to learn. She was amazing and I will always be grateful to her. That is the only teacher in 6 years that brought to my attention that something was very wrong. Finally, this year, in 5th grade I was going to make up for turning my head the other way. I was ready to give it a good fight. I was his mother! I knew this child better than anyone else in the whole world, and my only concern was his learning. The school atleast heard me out. There were meetings and questions and meetings and talking and meetings and….well, you get the point. They decided they needed to see this “struggle” for themselves and he was no longer allowed to bring home any work. The Speech and Language Specialist pointed out many times how she would agree to test him, even though his grades seemed fine. His grades? Let’s not forget to mention the most important part of this equation. The 1st few weeks of school, my poor child had 12 incompletes with mandatory ten points off for being late. The papers that came home had 27, 42, 57. However, if you checked the online portal , there were no grades showing up with less than a 70. No wonder nobody understood. The counselor recommended I have him tested for ADD and so I did. Although my answers diagnosed him 99%, the teachers test result showed he was a normal child. That is when I showed the doctor the discrepancy between his actual papers and the online portal. I showed him all the incompletes and the messages from the teacher dismissing my concerns. How much more struggle did they need to see? Although the doctor was confused by the discrepancy of the results, he had enough faith in my instincts to at least explore the possibility that my truth was the actual truth. He started him on a medicine to help with concentration, but asked me to not let the school know. It was important that he see, by documentation through email, if there was any noticeable difference in his work. So, I asked the teacher to send me a daily email updating me about his day. The next week I checked the online portal and burst into tears. I just couldn’t believe my eyes. Grades that were once in the 50′s and 60′s were suddenly transformed into 80′s and 90′s. All those years of struggle! If only I had known. I had heard of ADHD before, and knew several kids that were on medication. I never understood just plain ADD. These are the kids that often go unnoticed. They generally do not have behavior problems, they are good at looking busy, but their head is so overwhelmed with noise that they cannot even concentrate long enough to read directions. This sure explains his struggle with reading comprehension. These kids are often mislabeled as “lazy, inattentive, not working to their ability, and not paying attention to detail”. I felt like taking a giant permanent red pen and writing in gigantic letters DUH! THIS SCHOOL AND THESE TEACHERS ARE PATHETIC! But, that is how they mark something that is incorrect and that is not my style. Oh! I almost forgot what led me to agree to trying the medication in the first place. The pivotal moment for me occurred one Thursday evening. I was looking through his graded papers and noticed some disturbing comments in red pen. “Duh! Tell me something more meaningful”. Does that sound like something appropriate a teacher should write on a child’s paper after you tell her you believe your son may have a learning disability? That was it for me! Amazingly enough, just like magic, that paper was never to be seen again after I brought it to the principals attention. My intention for this blog is to educate people on ADD. It is amazing, that a school system, who is educated about this kind of thing, was never able to pick up on it. So, it is my hope to spread the word and prevent this from happening to any other child. I knew something was wrong, I just didn’t know what that something was. My advice to you is simple. YOU know your child better than anyone else. Never place the opinion of others over your own instinct. You do know best. The school now knows my son is taking medication. At our last meeting, the teacher told me she doesn’t know how he was ever able to complete any paper without it! What a different opinion than in the beginning of the year when she disagreed there was any problem at all. She actually says he is always on task now, hands all his work in on time, and in some ways has become a model student. She no longer writes DUH on anyone’s paper. I believe she is really trying to make up for the injustice and I appreciate it. What I do find troubling though, is that a team could agree they could see him struggle, but because he did not qualify for special ed, and the state did not require them to offer any help, they chose not to. What I did get, just a week ago, was an invitation for him to sit in on 6 week class to help reduce test anxiety. Funny, isn’t the standardized test coming up soon, and isn’t his grade a reflection on the schools performance and not on his learning? I’ll just leave you there with that thought. Years ago our family would vacation together. My niece and my daughter are a year apart and sometimes when we would all be cooped up in the same small space for hours on end, quite a bit of tattling would be taking place. One day, I came up with this fantastic idea and the “Tattle Book” was born. We told the girls to write every gripe and concern they had in that little book and at the end of the day the “adults” would look it over and someone would get back to them the next day. They loved that book. Every time they tried to tell on the other, one of us would say “tattle book” and they would write it all down. To our unexpected surprise, it worked. There was less tattling and the adults had less aggravation. And, the next day never even had to come. In the last few years I have faced some pretty unique circumstance with athletic clubs, and especially the schools my son has attended. For years I kept quiet, afraid of what the consequence might be for my children if I became the voice of the squeaky wheel. I have been avoided, shunned and humiliated all at the expense of preventing others from having to go through similar situations that maybe my squeaky voice could prevent. I can’t remember the day I found the courage to stand up for what I believe is right but I realize the consequence of sometimes public humiliation is not nearly as bad as the consequence of remaining silent. 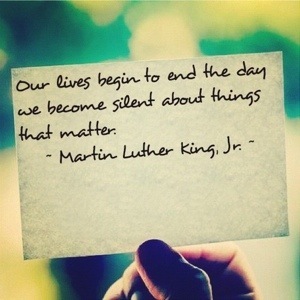 The first time I spoke up I felt a fire deep inside and I knew my voice had to be loud enough to speak for the ones who would always be silent. Tomorrow, I have a very important meeting. My squeaky voice has caught some attention and now someone has no choice but to listen. My question though, is this just an adult size tattle book I will now be writing in that no ever plans to read or will someone consider my complaints significant enough to take some action and make some serious change? The truth is I really don’t know, but it reminds me of one of my favorite quotes, ” Speak the truth, even when your voice shakes”. I have been writing in that tattle book for more years than I care to remember. I think that’s the point though don’t you? Keep em writing until they get too tired to hold the pencil. I am tired. I am drained, but for the sake of my own child and every child out there in the world, I will find the strength. If my words and my persistence makes a difference for even one person, than I served them well. Sometimes it’s not about changing a situation we are personally involved in ourselves, but taking one for the team to make change when you may not ever have the opportunity to see it for yourself. If we don’t sacrifice ourselves for the better good, what kind of a person are we anyway? This girl here is never going to find that out. Tomorrow I will hear my own shaky voice tell the truth and state the facts. I will represent every single child that has fallen through the cracks. I will represent every single mother that has spent every hour of every year devoted to the full time job of being their child’s advocate, and somehow, someway, I will find the courage and strength. Today I was going to take a day off of writing. To keep myself busy, I decided to go to the movies and now the writing will take care of itself. I saw August Osage County. I am not going to bring you through the details of the movie but what I brought out from it. We all have a family. We are born into a group of people that like it or not, we will remain forever connected too. We don’t choose our families, they are chosen for us. What we do choose though is what we bring to that family. Often times the people that we should trust the most are the ones that know the least about us. They are also the ones that are the hardest on us. We hide the parts of ourselves that make us feel ashamed so they are not reflected back to us through our family’s eyes. We keep secrets, and our family pretends not to know. It seems like the right thing to do at the time. But after years of hiding the life we really live, we sit down to our dysfunctional dinner table and wonder what the hell went wrong. We feel hurt and angry that our very own family doesn’t seem to know us at all. And, instead of supporting each other we carry our anger and baggage and hidden parts into battle and stomp out convincing ourselves we are the victim of a battle we’ve created in our own minds. It seems unfair almost that every decision a family makes affects the family as a whole. A new baby, a move to another state, marital problems. They affect us all. Each and every one. All families have problems. All families have dysfunction. In the end, it is only you who can decide to let those things drive you apart or bring the glue to help hold it together. Every member has their own story. Every member has a separate life. At the end of life though will you celebrate being alone knowing you have taught everyone a lesson or will your heart be bigger than your pride? Sometimes the people we hurt the most are the ones that actually love us the most. Sometimes we walk out on our family because in our hearts we know, that if we ever do come back knocking, someone will answer. Sometimes we test the people that love us the most and hurt and disappoint them in the most painful way because we know that no matter what we do, we will always be forgiven. That is just what family does. In the end, they really are the only people that care about what happens to us, because what happens to one, happens to all. Sad movie. Heavy movie but a representation of a real family living a very real life. So much for not writing….The lesson here, love your family, forgive them and don’t waste the precious moments you have while you are all still together. Someday, someone will be missing from that dysfunctional table and everyone will feel very sorry. Every once in awhile, I come across a story or a person that challenges and inspires me to be better. I am proud to say I found one of these angels today. Have any of you heard of the Napkin Notes Dad? I was browsing Facebook when I read about his story. 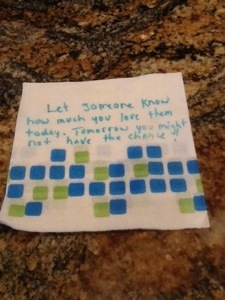 It is about a man named Garth who has written inspirational quotes and personal notes on napkins that he puts in his daughters lunch each and every day. In fact, he has written enough notes to last this young girl until her very last day of high school. He has battled cancer several times over the past few years and is currently battling prostate cancer. He knows all to well, that we never know when our time here on Earth is up and wants to make sure his daughter learns all the important lessons he feels responsible to teach. The most important lesson though is this, she is loved. Can you imagine how loved and cherished you would feel if someone took the time to write a special note just for you for the next several years of your life? It’s amazing to think how often we hear about children that feel unloved, especially when, in just a few seconds, you could give that child a simple reminder like this one, to make them feel special every single day. What a beautiful example of kindness and selflessness and an inspirational example to all of us everywhere. Am I going to run out and by a life supply of little napkins? Probably not. But maybe, just maybe once in awhile when everyone sits down for dinner, there will be a little note waiting there just for them. Inspire and encourage. If I had to define this man in two words, that’s what they would be. I am proud to say I will follow his example and I hope that maybe you will too.